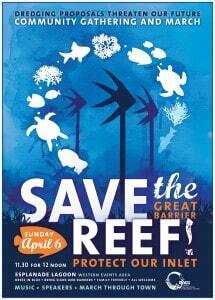 « Port Douglas reef rally – rise up for the reef! Ports North, is proposing to undertake a major dredging operation in Trinity Inlet, however there are serious environmental risks and major community concerns with the proposal. Given the sensitive Inlet environment, the proximity of the Inlet to Great Barrier Reef, and its value to the tourism industry, we believe that the risks are too high and that this activity should only go ahead if it can be clearly shown that the dredging will have no adverse impact on the natural environment. We call on Ports North and the Government to abandon plans for new ‘capital’ dredging for Cairns Port and to instead utilise the taxpayer money saved to support alternatives like cruise ship passenger transfer to the soon to be upgraded facility at Yorkeys Knob and support for small business and Industry that does not put the environment we rely on at risk. There will be a major event in Cairns April 6th 2014. Click on the poster for more details. The proposed Cairns Shipping (Trinity Inlet) Development Project would mean digging up an estimated over 5 million m3 of dredge spoil. Dredge spoil, the mud and other sediment removed from the sea floor, often contains heavy metals and other contaminants from industrial land uses and shipping. Options for dredge spoil disposal include dumping in the Great Barrier Reef Marine Park or onshore dumping options, both of which pose risks to marine life by increasing sediment and nutrient loads and introducing contaminants. Onshore dumping poses risks to terrestrial habitats as well as marine environments. The proposal also would require a doubling of the annual maintenance dredging program, with the ongoing impacts this would entail.